You’ve seen the “top picks” lists elsewhere online for the NAMM show, that massive Californian convergence of musical instruments and music-making gear. Add together the knobs and faders from such lists, and you could probably build a synthesizer Death Star and destroy Daft Punk’s hidden Rebel base. Of course, you’d only have a marginally larger Death Star than the identical one you could have built from last year’s gear. We’re doing things a little differently: picking out entirely random stuff that managed to reach for the sublime — including the sublimely absurd. Bad is better than boring. We’ve seen strange things that simply failed, or at least substantially creeped us out. Yeah, that’s Roger Linn, the LM-1 and former MPC designer without whom drum machines as we know them today wouldn’t exist, holding the “Drum Machines Have No Soul” bumper sticker he acquired. That’s why we were in Anaheim. We’re still waiting on Barry Wood’s legendary NAMM Oddities, so we’ll focus on our own sense of the exceptional. 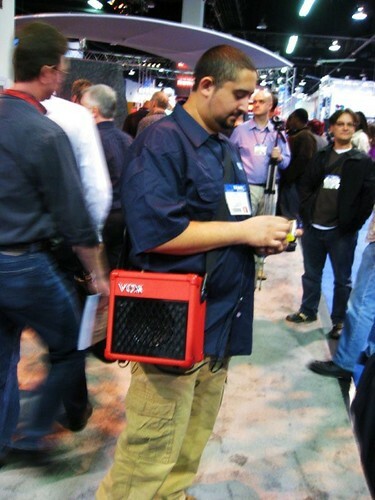 Vox DA5 Portable Digital Amp as Mobile Show Floor Boombox @ Korg: Why have booth babes wander your booth when you can have entire amps doing the same? The Korg Kaossilator, all-in-one synth + effects box (and capable of producing entire albums), plus this portable amp, costs $340 street. Neither product is new — yet they still overshadow some other news from the show, so much show that they started showing up in “new products” roundups. WIN. Side note: I want the pink one, so I can then play the raunchiest, glitchiest sounds through it I can muster. The Least Marketing Hype Award: CME, the brilliant Chinese music manufacturer, had set up this display for an upgrade board for their UF keyboard line. Topping that, it was difficult for anyone to tell us in English any of the details of the board. And yet, with show booths with giant BOSS pedals you can walk into (hello, Roland) and other gimmicks, we couldn’t be more pleased. WIN. Access Going Glitch: German synth maker Access is known for pristine, virtual-analog sound and brilliant synths. But then something magical happened: granular oscillators. Richard Devine set up shop in the Access booth for the whole show and wowed crowds with the music pouring out of the minimal white boxes. Access told us the Virus Ti’s new grungy sounds were so popular, some visitors apparently missed the fact that it’s just a small part of the Virus. Glitch is in, and you have an all-white, THX-1138-style booth? That counts as a Triple WIN. Thankfully, unlike last year’s NAMM show for Richard, this one was completely without brushes with death — seriously. More on that in our upcoming interview. I was a little nervous when we went to a particularly sketchy Anaheim IHOP with him that NAMM might again prove mortally dangerous for one of us, but we escaped unscathed. Everyone we care about, living through NAMM: WIN. “Live. Play. Play.” Cordoba Guitars reminds us with this booth campaign and slogan that you probably don’t want to be playing post-coital keytar. We FAIL. They WIN. Darned guitarists. Side note: if you find a significant other who wants to listen to the granular oscillators on your new Virus | TI Snow in bed, keep him/her. 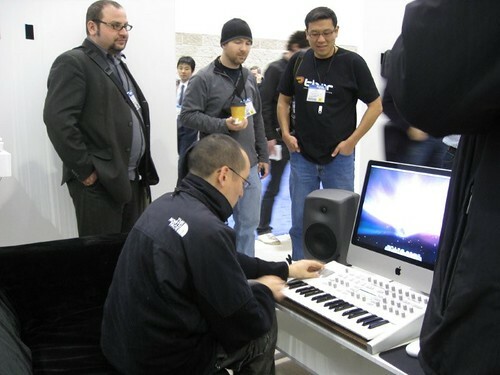 Hanukkah: Proof positive you can exhibit anything in a NAMM booth. As the NAMM slogan goes, “Believe in Music.” And believe in Hannukah. In … January. 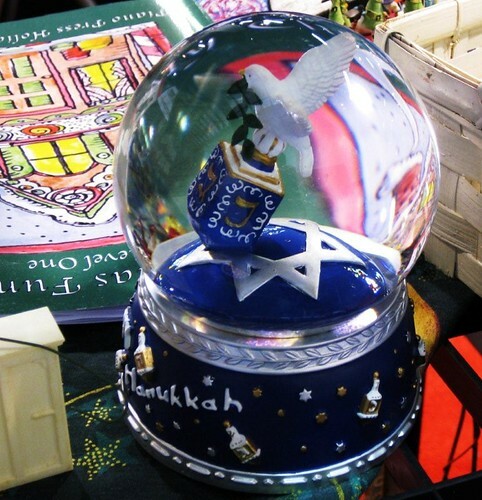 With a dove of peace bringing a dreidel to the world. WIN. 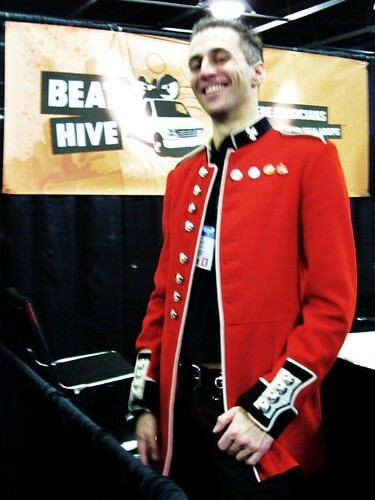 Booth Mounties: Okay, just one , um, soldier of some kind (see comments for evidence about why I shouldn’t be running a blog on military uniform, though it’s cool whether I know what it is or not). And we’re not totally sure what it has to do with BeatHive.com, a community for musicians to buy and sell loops. But it easily out-cools the various trashy girl-with-miniskirt look in all the guitar booths. WIN. The LinnDrum II, in the flesh — sorta: Finally, we got our hands on the LinnDrum II, the drum machine / synth from Dave Smith and Roger Linn we’re dreaming about every night (formerly known as BoomChik). We could touch it, feel it … smell it. The one thing we couldn’t do was hear it, because a fully-functioning prototype isn’t ready yet. But the lights work. Here’s the funny part: the LinnDrum II came up again and again as one of the top picks of the show from everyone we talked to, even if it couldn’t make sound. 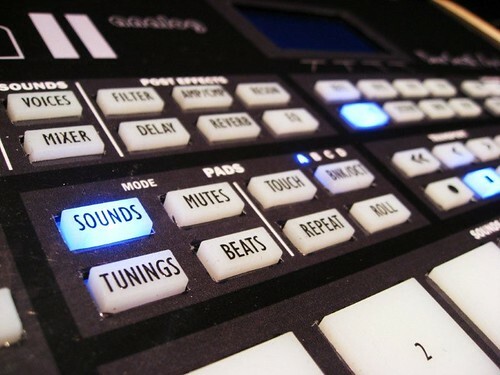 Never mind that Akai had a fully-functioning MPC5000 with hard disk recording. It gets handily beaten by a LinnDrum before the latter even makes a noise. That counts as FAIL for Akai, I’m afraid — and gives Dave Smith Instruments an indisputable WIN. 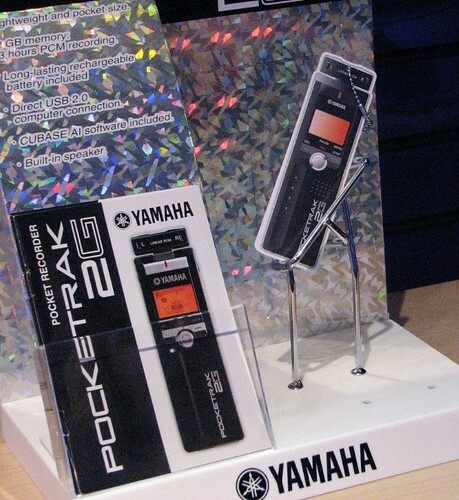 Best Non-Functional Prototype of the Show Award: Despite the LinnDrum II’s success, Yamaha easily beats it. I mean, have a look at this. It’s incredibly thin. Steve Jobs, MacBook AIR — eat your heart out. And it goes on a keychain. WIN. Wait, what’s that? Oh, okay, Yamaha did actually bring a working unit to Anaheim, and Sonic State filmed a detailed demo. But that’s what separates CDM from other media outlets. We take the time to take photos of, uh, cardboard keychains. 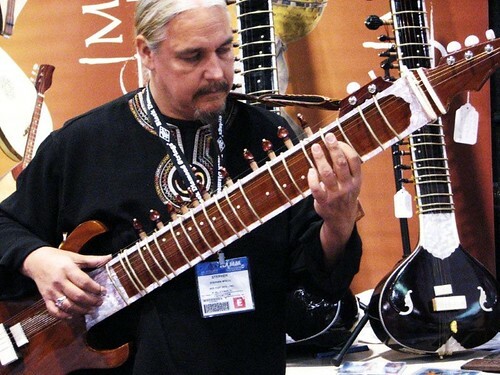 Guitar + Sitar = Crazy Delicious. Okay, maybe it’s an invitation to make terribly cheesy world music, but the instrument from Mid-East Manufacturing sounds great, if not wholly sitarful. And so long as instruments continue to cross-breed, the future is bright. You know, via evolution. WIN. Most underrated item at the show: Moog Music’s Minimoog Voyager Old School got all the love — and attracted all the haters along with it. But sitting next to the new Moog synth was the first real dedicated controller device in Moog’s history, the MP-201 Multi-Pedal. It’s really beautiful, and sends not only MIDI (over both standard MIDI and USB) but control voltage, too. It even has tap tempo and internal oscillators. It could be the best device for your feet ever. WIN. Best Swag of the Show Award: Our friend Amanda Whiting scored one of these from the Ableton booth. They were apparently hidden, like in a secret bonus cavern or something. 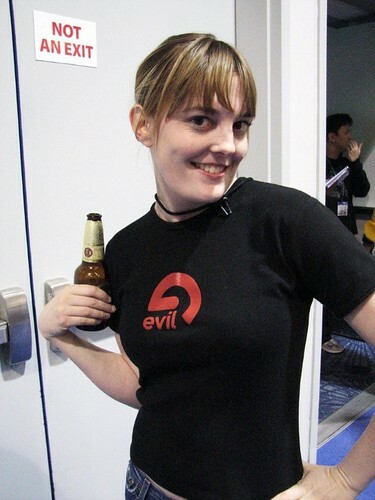 Sure, some anti-Ableton DJs might take the “evil” message literally — but no matter. We want one. And, darnit, Amanda beat us to it. WIN. 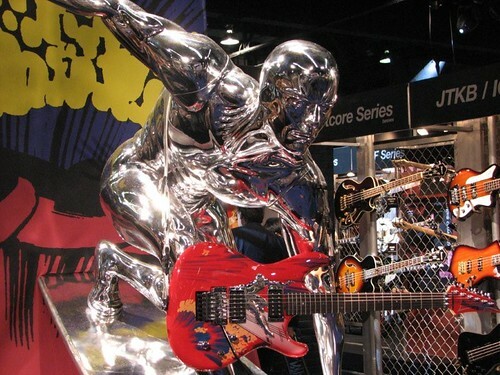 Silver Surfer + guitars: Okay, yes, I should have observed that this isn’t just any silver surfing man, it’s the surfer from Joe Satriani’s “Surfing With The Alien”. And, believe it or not, but if I didn’t sit behind my computer blogging and making digital music all day, this would be what my physique would look like. I think that means, for me, FAIL. For the Ibanez Silver Surfer: WIN. Roland’s Digital Harpsichord: For the record, I’ve spent a reasonable amount of time (let’s say, more than the average person) playing real harpsichords. And this sounds and feels like the real thing — even the action is right, though it’s far more forgiving than the original. 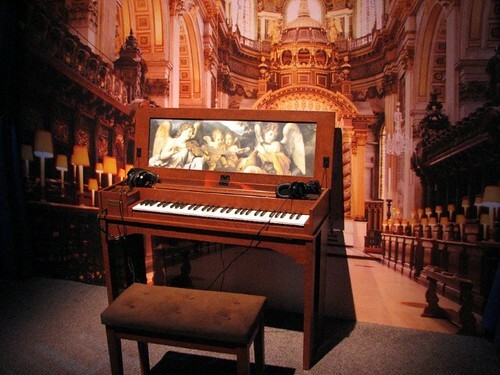 But it’s the fact that Roland kept going, that they staged a fake Baroque setting for their instrument in the midst of an otherwise generic NAMM booth, complete with real curtains, added faux stained glass to the sides, provide optional, interchangeable decoration… it’s just so beautiful. There are multiple tunings, including 415 Hz and 392 Hz (though fully-adjustable tunings would have been nice), and there are five types of temperaments. I want a C-30 and a new church gig. And Roland, by boldly employ 21st Century digital technology to produce an 18th-Century sound in a case that looks unmistakably like a 17th-Century virginal, then giving it a product identifier that sounds like a 20th-Century military cargo plane, you win the Greatest Anomaly of NAMM 2008 Award. Thanks to my colleague Quantazelle for her editorial and research assistance, and photographizing.